Green Delicious Restaurant is a WordPress restaurant theme that could easily be modified to work as a WordPress cafe theme. The theme is developed by Plentong and available for purchase at ThemeForest. Its unique design is striking and truly different from most competing themes. The design features pixelated images, which may seem a bit odd at first. The main menu has pixelated sliding images as well, that are only present when a reader hovers their mouse over the menu option. The stock imagery they use is pixelated, but you can always replace them with high-resolution images of your food and other menu items. With a few tweaks, this theme could be just what you are looking for! Delicious comes with 3 different color options – blue, green, and brown. This can be somewhat limiting, but at least they are good shades of the colors that are available. You can choose from 2 different fonts for the main text: Arial and Georgia. There are 8 areas to place widgets on the homepage, and this theme is fully compatible with most 3rd-party widgets. The theme comes with 8 useful widgets already installed. The menu features a drop-down option with up to 2 levels, and the comments section on your post is threaded with up to 5 levels, which allows your visitors to have discussions with each other – hopefully about how good your food is! Green Delicious Restaurant comes with a well-documented instructions file, to help those who are new to web development customize their sites properly. Also, shortcodes are compatible with this theme, making it easy to add extra features and tweak the appearance. Lastly, the theme is cross-browser compatible, meaning it has been tested and works with the following browsers: Safari, Opera, Chrome, Firefox, and Internet Explorer. 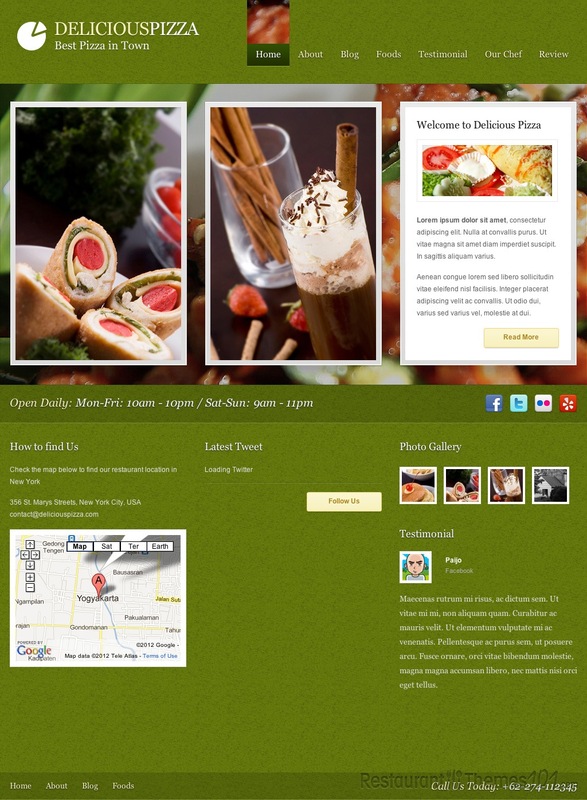 The Green Delicious Restaurant theme is also available as a HTML template.